More courage. More focus. More results. More happiness. More fulfillment. Do you believe, deep down inside, that you’re capable of more than you’re currently doing or getting? You’re not alone. This is my passion. I don’t give a damn about the surface level BS. I want to know who you are, what drives you, what you want to accomplish with your life and I want to help you make it happen. Are you ready to pursue your authentic self – the ultimate version of you – to chase that fire that burns deep down inside of you and keeps you up at night? Or that you had the discipline to follow through, the awareness and mental toughness to overcome adversity, and the focus to not get distracted. Being a great human is not a one-dimensional pursuit. Whatever your pursuit may be – health, fitness, business, diet, personal development – they’re all aspects of being a well-rounded and high functioning human being. And that’s what this event is all about – providing you with the tools and the fuel to become the best human you can be. If you’re committed to growth and development, this event is for you. But here’s the secret the “gurus” won’t tell you. The THING is never the thing. It’s not about the diet, workout plan or business strategy. The true secret lies in mastering one’s mind and one’s self. The courage, discipline, awareness, drive, focus, and perseverance – everything that is required to succeed in sports, business, and life depends on how well we understand and master the space between our ears. The key to achieving the more that you want from your life is in your mind, your values, your choices, decisions and actions. I know what it takes to develop an unstoppable, fearless mindset. I’ve used the methods I’m going to show you to become a fitness model, a successful gym owner, an internationally published author, host of multiple top-rated podcasts, and now a sought-after consultant and speaker for athletes and organizations around the world. Through all these pursuits, my mission has remained constant. To educate, empower, and help others. I’ve helped thousands of people just like you transform their minds – and lives! I’ve had the good fortune to study and work with Olympic and professional athletes, Hollywoods celebrities, Special Forces Operators and elite entrepreneurs and C-Level executives. These high performers come to me for one reason – I get them results! I help them understand their mind and body so they can make it work for them – instead of against them. And we’ll do the same for you. Once you understand the human body and brain, it becomes exponentially easier to control it – and to craft your dream life. The beautiful thing is this: the ability to understand human physiology and behavior is a skill that transfers across any domain or pursuit. This is precisely why I’m able to help such a wide array of individuals – from athletes to business executives, to law enforcement and military operatives and everyone in between – they’re all humans functioning with the same operating system. Just as I’ve helped them, I’m going to show you how to increase self-awareness so you can guide your life down any path you choose. Are You Ready To Take Control of Your Mind – AND Your Life? This Better Human Workshop is designed for motivated individuals interested in personal and professional development in an effort to help you grow and develop into the highest expression of yourself so you can pursue progress, drive more change, make a greater impact, and be better stewards for yourself, your communities, and the world. If that sounds like you, this event is for you. If you’re passionate about progress, interested in mastering your mind, improving discipline, accountability, communication, and impact – both personally and for your team, business or organization, then this is for you. If you’re not interested in growth, development, and progress, close this page now. The more we choose courage, the easier it gets. Do you have the courage to pursue your authentic path? Believe in, bet on, and invest in yourself. You future self will thank you. 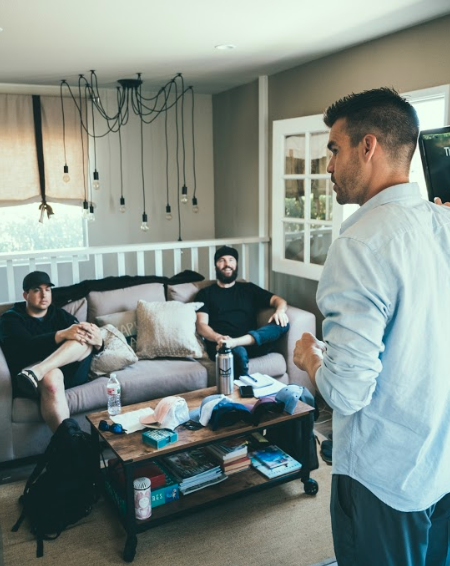 In short, because progress never stops, and this is an amazing opportunity to meet like-minded individuals in an immersive weekend workshop that will provide both the fuel and the tools to help you along your journey. Most importantly, you’ll leave with a clarity of focus, the tools you need to succeed and action steps to propel your mission forward indefinitely. Say goodbye to: fear, frustration, the pain of regret, those pesky feelings of stagnation and being passed by. AT THE WORKSHOP: World class coffee will be provided each morning. Water will be available throughout the experience. We will provide a mid-day meal for a working lunch and dinner will be on your own.